For Americans and others not familiar with the British concept of an "annual", they are yearly-published (hence the name) A4-sized slim hardback books, anywhere between 50-100 pages in length, and aimed squarely at the children's Christmas market. Every year in Britain, dozens of annuals are published, with the subject matter including popular movies, TV shows, pop stars, comicbooks, etc. 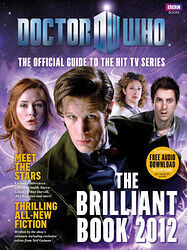 A typical Doctor Who annual contains a mix of illustrated short stories, comic strips, puzzles and factual articles. Usually the authors and artists are not credited, hence they're not listed here. Every year between 1965 and 1985 (with the puzzling exception of 1971), Manchester-based publishers World Distributors released a Doctor Who annual — also four Dalek Annuals and one K9 Annual. Between 1991 and 1995, Marvel published 5 Doctor Who Yearbooks in a broadly similar format, though aimed at the show's maturing fanbase rather than the previous (kids-oriented) World annuals. After the relaunch of the new series, Panini published a 2006 annual and from then until 2009 published a yearly "Doctor Who Storybook" in a similar format — which (despite the slightly childish name) are the spiritual successors to the Marvel Yearbooks, containing simply 7 or 8 lavishly-illustrated short stories, with one or two comic strips for good measure. These storybooks have won wide praise from fans — at least, most fans old enough to be reading this site! Starting in 2010, BBC Books (nowadays owned by Random House) took over and started producing The Brilliant Book of Doctor Who instead, with a similar format to the above Storybooks. "Brilliant Books" were produced for 2011 and 2012 but sadly no further volumes since. In parallel to the Storybooks, starting with The Official 2007 Annual, Penguin (current owners of the BBC Children's Books imprint) have published their own range of "Official Annuals", aimed squarely at younger fans with a mix of stories, comic strips, puzzles, facts and photo features (very similar to the World annuals in fact). Despite the lack of appeal for older fans, these annuals have been highly successful, for example the 2007 annual was the UK's overall bestselling annual of the year. A warning if you're searching for a particular old annual on Amazon or eBay — the year of publication is always printed inside each annual, but the title of the annual traditionally refers to the following year. For example, the annual published in September 1975 is called the "1976 annual". This can lead to confusion for some of the annuals which don't include a year in the title. For example, the 1982 annual simply says Doctor Who Annual on the cover, so the publication date of 1981 printed inside means some online merchants confuse it for the 1981 annual and list it accordingly on their site. Be sure you know what you're buying! A final note: There have been a number of "annual-esque" books which are similar in form and content to the annuals, but technically aren't annuals because they aren't marketed as such (e.g. they don't have a year number or don't say "annual" or "yearbook" on the cover). These books have been listed in the Miscellaneous Books section instead and are as follows: The Dalek Book, The Dalek World, The Dalek Outer Space Book, Invasion From Space, The Amazing World of Doctor Who, Adventures in Time and Space and Journey Through Time. In the latter three cases, the books mostly comprise of stories reprinted from annuals.